Transforming a t-shirt into a tote bag is an earth friendly way to recycle old clothing into a useful new item. Clothing sent to landfills is often made from synthetic fibers that are not biodegradable, so finding ways to reuse old clothing is one eco-friendly way to help reduce the amount of waste sent to landfills. A few alterations will turn an unused t-shirt in a handy tote bag that is suitable for a day at the beach, or anywhere a tote bag is needed. Making a t-shirt tote is less expensive than buying a manufactured tote, so it saves money while doing a good thing for the planet. Selecting the proper size t-shirt to hold a beach towel, bottled water, sunscreen, and other items needed for a day at the beach is the first step. Almost any size shirt will work for a t-shirt tote bag, but a medium will generally be the smallest size that accommodates a beach towel and other summer necessities. For best results, in addition to a suitable t-shirt, gather the following sewing supplies before beginning this project. Insert the ball point needle in the sewing machine. Ball point needles and pins, are designed for use on knitted fabrics. Ball points do not cut the fabric fibers and cause runs, while sharp needles and pins will damage knits. Sew across the bottom hemmed edge of the t-shirt, using a sewing machine set to make a tight zigzag or other stretch stitch. With the t-shirt still wrong side out, measure 4 inches up from the bottom seam and make a small tailor's chalk mark on each side. Turn the t-shirt right side out, and tuck the bottom seam up, into the body of the shirt. Look inside, and align the folds with the tailor's chalk dots. Pin the folds in place with straight pins. Tack the fold in place by sewing over the side seams, catching the fold in the anchoring stitches. This will give the bottom a boxed edge that will sit flat when the bag is filled. Use the cutting scissors to cut the sleeves off and open the shoulders. Begin cutting the underarm area of the shirt, and continue cutting right on top of the seam. Follow the shoulder seam across to the neckline. Leave the ribbing intact, but finish opening the seam. Cut the nylon strap in half. Place the raw ends of the strap against the raw edge of the fabric, then making a 1 inch overlap, pin one piece to the front of the shirt, at each edge of the neck ribbing. Pin the other half to the back of the shirt at each edge of the neck ribbing. Stitch over the end of the strap, using a 1/4 inch seam allowance the first time and a 1/2 inch seam allowance the second time. Fold the raw edges of the fabric under, and sew the folded edge with a zigzag or other finishing stitch to finish the seam. Make sure the top-stitching goes over the strap ends to add an extra layer of strength. Adding a hook and loop closure to the beach tote will reduce the likelihood of lost items. Cut the hook and loop to the same length as the neck ribbing between the handles. Position the Velcro 1/2 inch down from the top edge. Then, using a long, straight stitch, sew over the hook section, and then the loop. 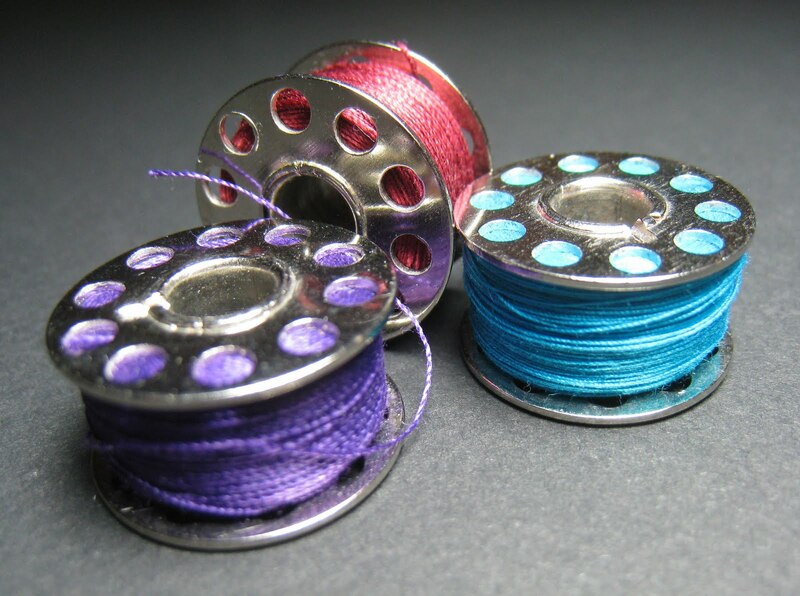 A special thanks to Stacy McDougall and ArticleGeek.com for this informative article about sewing thread. What kind of sewing thread should I use? This is one of the most common questions we hear. The answer is simple, and difficult, at the same time. Stacy McDougall's company, Red Rock Threads sells quilting, sewing and embroidery thread online. View the www.redrockthreads.com Sewing Thread that Red Rock Threads has to offer. Sewing thread image courtesy of Dvortygirl and Wikimedia Commons. You can steam linen material to preshrink it, or as a way to iron linen garments and drapes. Steaming will even remove some dirt from linen. 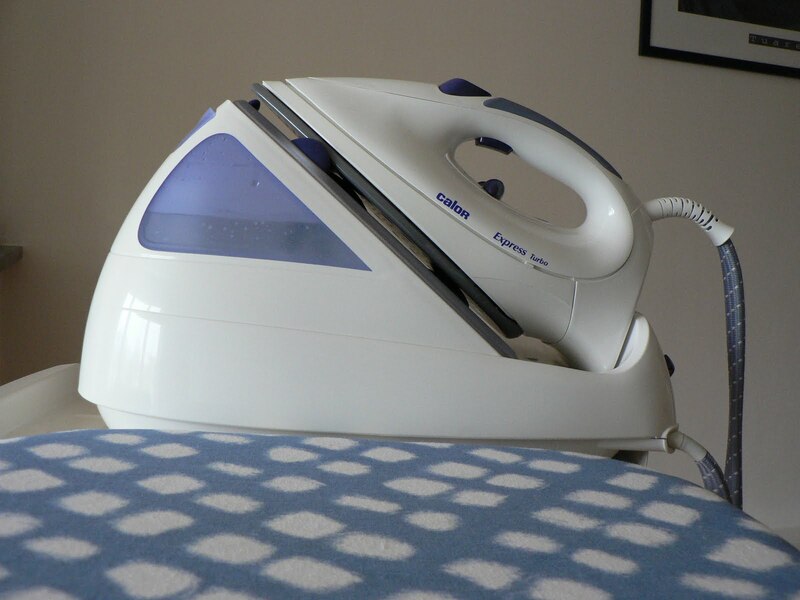 Steam iron image courtesy of Wikimedia Commons. It can be rewarding to make your own drapes, but if you want to save your creative energy for other projects, check out this great online drapery supplier's discounts. Fine Italian drapes, that you don't have to sew, to go along with your own beautiful, decorative sewing projects. These customized items, shown above, are available exclusively through the Stitching it Right Zazzle Store. While the selection is meager, at the Stitching it Right Zazzle Store as of today because it's a pretty new experiment for us, new custom items will be added daily. Check it out, and let us know what you think, or if you are looking for an item you don't see in the store. I know this is a site about sewing, but it is HOT here today, so I am thinking about swimwear. I have made swimsuits before, and I LOVE working with Spandex. (It's a surprisingly easy-to-work-wit fabric as long as your scissors are sharp and you use ball point needles and pins. If you're not into making your own swimsuits, check out the deals offered at the site above by clicking on the link above. They have some beautiful swimsuits in different sizes, and the prices look pretty good, too. Easy to Sew Outerwear Accessory: Making a men's scarf, either to give as a gift or to save a little bit of money by making it at home, does not require knitting or crocheting knowledge if fleece is used. If you want to make a men's scarf you do not need to know how to knit or crochet. Polar fleece fabric with a finished edge makes an attractive and exceptionally warm scarf. The synthetic fibers used to make fleece traps body heat, making it suitable for winter outerwear. Fleece is easy to work with because it is durable, and it does not fray the same way a woven fabric frays. The design used to make a scarf for a man is very similar, and often identical, to the design used to make a scarf for a woman. The main difference, between women's scarves and men's scarves, is the fabric colors and patterns. Look for muted tones, or masculine patterns when making a men's scarf. Use a simple finishing stitch when the scarf. 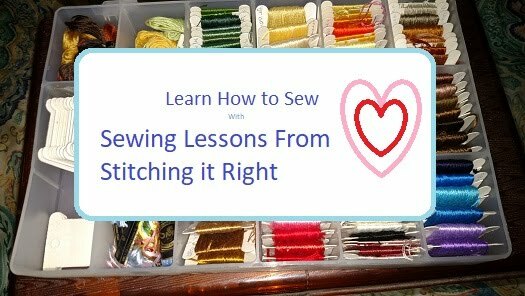 A type of sewing machine known as a serger is commonly used to finish the raw edges of fleece, making a stitch that resembles a blanket stitch. The average household sewing machine will make a zigzag stitch but will not make a serger stitch. According to The Sewing & Craft Alliance a zigzag stitch is a simple finish that is suitable for most fabrics. Lay the fabric out on a work table and smooth it with your fingertips until it is flat. Make a tailor’s chalk mark 1 inch in from each corner. Place the quarter on the fabric so its edges line up on the marks to make a pattern for rounding the corners. Draw around the edge of the quarter from mark to mark on the corner, but do not make the complete circle. Trim the edges off using the scissors. This will make a curved edge, and it will be easier to sew than a corner with a 90 degree angle. 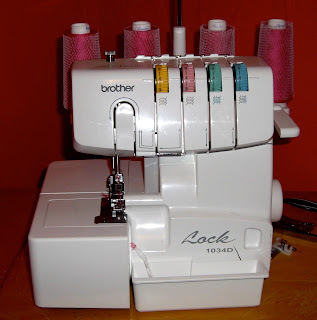 Set the sewing machine to make a zigzag stitch, blanket stitch, or any decorative finishing stitch you like. Fold the scarf in half, the long way, to find the center, and then begin sewing from this point. Sew close to the edge and go all the way around the scarf. Overlap the seam by about 1/2 inch when you reach your starting point. Serger image (above) courtesy of Dweeebis and Wikimedia Commons. Some dogs really enjoy wearing sweaters or sweatshirts. Making a dog sweatshirt is an inexpensive way to help a pet be comfortable on cool days. Some dogs do not like to wear sweaters or jackets because it makes then too hot. Dogs with thin fur - like dogs with their summer coats - and older dogs with arthritic joints - often enjoy the warmth of a sweatshirt on a cool day. A sweatshirt is often a better choice for a dog than a sweater is because claws can get caught in the loose weave of sweaters. Sweatshirts are not as likely to snag their paws. Sweatshirts provide a smooth, tightly woven surface that provides warmth to the dog wearing the sweatshirt. Finding the right sewing pattern for a dog sweatshirt is pivotal to successfully making the sweatshirt. 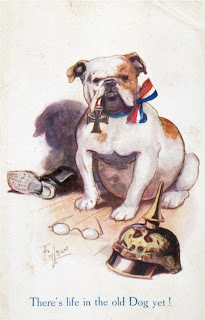 Begin by considering the dog's personality and also by being aware of one's own level of sewing skill. If the dog does not like to have anything touching its head it is best to avoid sewing patterns with hoods and high collars. Experienced sewers might enjoy crafting an elaborate sweatshirt with a lot of details. Inexperienced sewing machine operators, on the other hand, would get more satisfaction from making a simple, classic style. There are different types of fleece fabric. Dogs living in extremely cold climates will benefit from heavy polar fleece while dogs in more temperate climates will be more comfortable in a sweatshirt made of lighter fleece fabric. The pattern and color of the fleece should also be carefully considered when selecting fabric. A colorful or patterned fabric will make it easier for people to see the dog when it is walking outside. The fleece should be preshrunk either by ironing with a steam iron or laundering the fabric and running it through the dryer. As a rule, it will not shrink, but it is easier to preshrink and be sure than it is to be sorry later. This will save the bad feeling of making something only to find it too small to use after washing. The dog's measurements should be compared to the pattern before the cutting is started. It isn't always possible to get a pattern that is exactly the right size. If an inch or two needs to be added to the pattern - cut the pattern, place a piece of paper in the gap, slide the pattern out the inch or two that is needed, and tape the pattern to the extra paper. Cut and sew the fleece fabric according to the pattern directions. One thing that is not always mentioned in pattern directions is - if a dog has hip dysplasia it is helpful to add elastic straps. The straps should start on each side of the dog's tail and fasten just in front of their hips. This holds the back of the sweatshirt over their hips to help keep their hip joints warm. Planning and making a dog sweatshirt is a creative and inexpensive way to help your pet be comfortable on chilly days. A therapeutic foam dog bed will help make an arthritic dog comfortable. A basic foam dog bed is easy to make and the dog will enjoy sleeping its new bed. Dogs, especially large dogs, often begin to show signs of pain when aging. Hip dysplasia and arthritis are two common indicators of dog health that result from the aging process. Nothing can stop the aging process, but making a therapeutic foam dog bed is one way to help dogs remain as healthy and as comfortable as they possible. A basic foam dog bed will keep the dog elevated - away from chilly floors and drafts. A dog sleeping on a foam mattress will be warmer and less achy than a dog sleeping on a floor. What Supplies are Needed for Sewing a Foam Dog Bed? The basic supplies needed to make a foam dog bed are thick foam, water resistant fabric, thread, scissors, a yardstick, and a sewing machine. There are a lot of types of foam available, and almost any kind will work. If, however, the dog has advanced arthritis or hip pain, a memory foam dog bed would offer the most comfort. Contacting an upholstery shop to get memory foam might be necessary if the local fabric shop does not have it. The best fabric will be one that is treated for stain and water resistance. Vinyl upholstery fabric is good if the dog bed will need to be wiped clean very often. Measure the dog’s height and also measure from the tip of its nose to the end of its tail. Add a minimum of four inches to get the ideal dimensions for the foam mattress. If the foam does not come in a wide enough piece, cut an extra section and glue the pieces together. Cut the waterproof fabric so it is one inch larger on each side than the foam dimensions. Cut the band that goes around the edge of the foam so it is two inches wider than the foam thickness. If the foam is four inches thick, for example, cut the strip six inches wide and long enough to go all the way around the foam mattress. Place the band against one of the large fabric pieces with right sides together. Measure three inches up the seam line – start sewing at that spot and go almost all of the way around the edges. Stop six inches from the starting point. This reduces the need to guess if the band will fit because it leaves room to work when closing the band - without leaving a big gap. Keep the band ends right side together and sew the band closed before finishing the main seam. If turned right side out it should look something like a sofa cushion – but do not leave it turned. Position the other large piece of waterproof fabric right side down against the raw edge of the band. Sew three sides of the cushion closed. Turn the cover right side out. Insert the foam. The cover should be loose because the closing seam will be top stitched. Fold the edges under 1/2inch and hold the foam down so it will fit under the sewing machine presser foot. Finally, close the seam. A foam dog bed creates a comfortable sleeping surface that helps older arthritic dogs with pain reduction. Less pain means a more mobility and better quality of life for the dog. Copyright Laure Justice. Contact the author to obtain permission for republication.Originally published on Suite101.com. Old Dog Poster courtesy of Wikimedia Commons.